The new year brings a variety of brand new art by Art in Bloom Gallery’s core artists to the gallery. Feast your eyes on new work directly out of the artist’s studios. Art in Bloom Gallery’s core artists include: Bradley Carter (painting), Bob Bryden (printmaking), Debra Bucci (painting), Richard Bunting (blown glass), Elizabeth Darrow (painting), Brian Evans (ceramics), Susan Francy(photography), Mark Gansor (painting), Joanne Geisel (painting), Dumay Gorham (sculpture), Harold Hodges (photography), Dave Klinger (photography), Joan McLoughlin (painting), Jessie Robertson (painting), Gale Smith (painter), Traudi Thornton (ceramics), (Joe) P. Wiegmann (photography) , Michael Van Hout (sculpture), and Kirah Van Sickle (mixed media and painter). 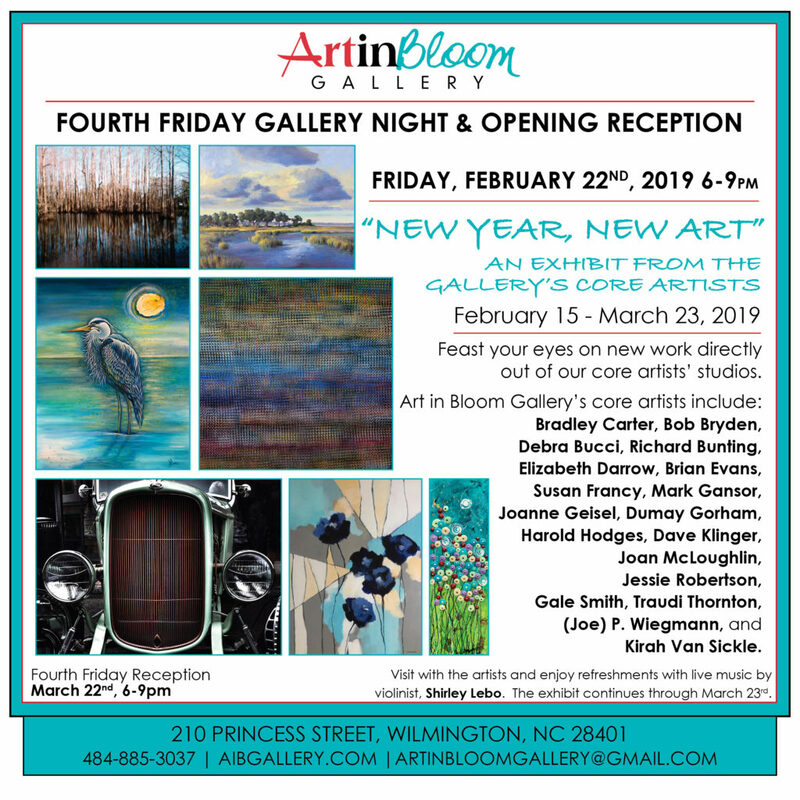 Join us for the opening reception, held during the Arts Council of Wilmington’s Fourth Friday Gallery Night, on Friday, February 22nd, from 6-9pm. Visit with the artists and enjoy refreshments with live music by violinist, Shirley Lebo. The exhibit continues through March 23, 2019. This entry was posted on Friday, February 22nd, 2019 at 6:00 pm	and is filed under Special Event. You can follow any responses to this entry through the RSS 2.0 feed. Both comments and pings are currently closed.